Vulnerable people on London’s streets will have an easier time after Caroline Russell AM raised monitoring bus stop bypasses with the Mayor. Bypasses let bikes ‘stream’ around the back of bus stops to avoid getting tangled up in traffic overtaking stationary buses. Concerns have been raised over how this could affect people with mobility issues getting to and from bus stops. 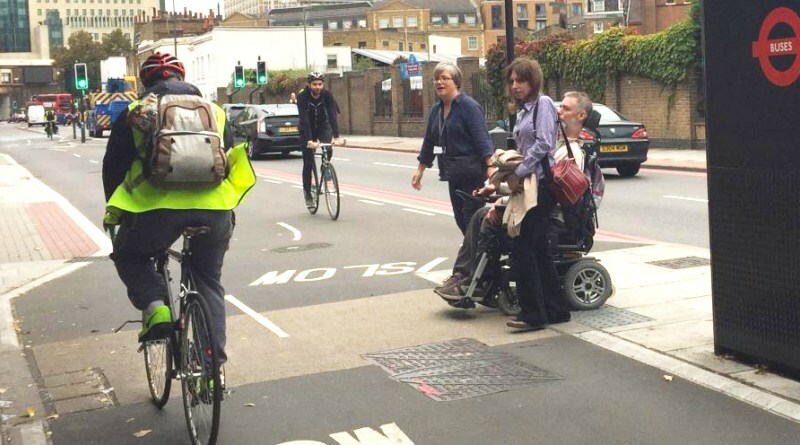 After Caroline Russell’s questioning, the Mayor has promised to trial six zebra crossings over bike lanes at bus stops to make journeys easier for people with disabilities. “I am pleased to hear there have been no reported collisions between pedestrians and cyclists at bus stop bypasses and that the Mayor will keep monitoring how these are working. “The people who should be listened to are the people who can struggle with travelling around the city so I’m glad that a working group including older and disabled people will be involved in monitoring these zebra crossing trials and reporting back on them. How is Transport for London (TfL) monitoring for conflict between bus users and people cycling past at sites where bus stop bypasses have been installed? Please list the locations that are and are not being monitored and share TfL’s findings so far. TfL monitors the entire Cycle Superhighway network to ensure it is operating safely and effectively. This includes more than 50 bus stop bypasses across the capital. There have been no reported collisions between pedestrians and cyclists at bus stop bypasses. However, I do understand concerns raised about them, particularly from vulnerable pedestrians such as older people and blind and partially sighted people. Stratford High Street, Stop M.
The trial sites vary in the numbers of cyclists and pedestrians using them and are spread between Cycle Superhighway 6 and Cycle Superhighway 2, including both one-and two-way cycle tracks. These sites will be monitored before and after the zebra crossings are installed, using video surveys, pedestrian and cyclist surveys and accompanied journeys with disabled people. The results will be published by spring next year. ← Will the Mayor take legal action against Volkswagen?